Spain Park players celebrate during trophy presentations last Saturday at the BJCC Legacy Arena. Journal photos by Marvin Gentry. More photos at otmjsports.com. 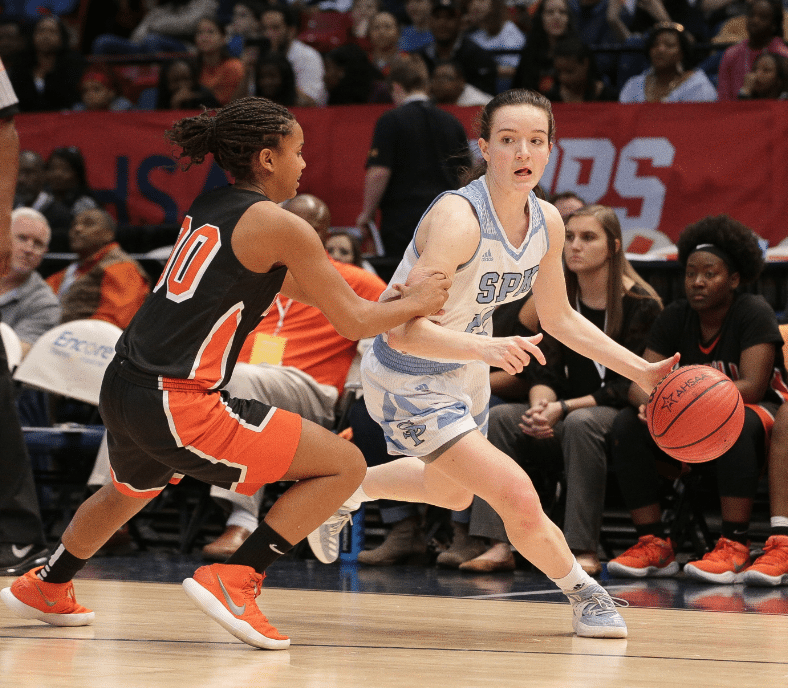 Spain Park won its first girls basketball state championship March 3 in dominating fashion – a 56-26 victory over McGill-Toolen Catholic from Mobile. McGill-Toolen made just nine field goals against a team that had been preparing for that moment. The Jaguars were led by senior Claire Holt, who had 20 points, five rebounds and four steals. She knocked down three 3-pointers and was 5-of-5 at the foul line in an effort that earned her tournament MVP. Sarah Ashlee Barker added 12 points, nine rebounds, two assists, three steals and a blocked shot. Spain Park’s Claire Holt sank three 3-pointers, was 5-of-5 at the foul line, and had five rebounds and four steals to earn Class 7A state tournament MVP honors. A year ago, crosstown rival Hoover defeated the Jaguars 51-47 in overtime. But this year, many of the same girls were able to redeem themselves at the Birmingham-Jefferson Convention Complex. Two of them – Holt and Barker, just a sophomore – were named to the Girls 7A All-Tournament Team. Spain Park built a difficult schedule around Birmingham this season that prepared them for the run and the dominating performance in the championship. Ramsay prepared the Jags; so did the Bucs. “If you’re trying to get wins or you’re new to the system, you may not want to go out and schedule Ramsay three times, or Hoover or Hazel Green or LeFlore or these guys,” said Chase. “But I’ve been here long enough that we want to try to win a state championship. And if we’re going to try to win a state championship, we need to play the absolute toughest teams we can play, so that we don’t get into the playoffs and we don’t see something in the playoffs that we haven’t seen in a game. Mike Chase has been the head coach at Spain Park for nine years. Chase has been the head coach at Spain Park for nine years. He’d spent a couple of years at Clay-Chalkville before taking over in 2009. He wasn’t always sure that this path would take him to the first girls basketball state championship in Spain Park history, but he was sure that he wanted to coach. And he is happy that it’s here. Sophomore Sarah Ashlee Barker added 12 points, nine rebounds, two assists, three steals and one blocked shot to earn her way onto the All-Tournament Team. Chase coached two teams at Clay-Chalkville to the AHSAA State Championship, and this was his first at Spain Park. He has yet to take a day off; one day after his state championship, he’s in the gym practicing with his AAU team. Spain Park’s girls will technically get a two-week break, but their coach has no intentions of slowing down.